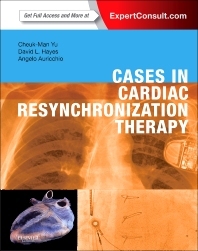 Cases in Cardiac Resynchronization Therapy, a brand-new medical reference book for cardiologists, electrophysiologists, surgeons, and primary care doctors, offers an informative and structured view of the newest approaches, treatments and follow-up care methods for heart failure patients treated with Cardiac Resynchronization Therapy. Complete with practical examples from top leaders in the field, this resource is designed to equip you with the cohesive, expert knowledge you need to make the best use of today's available technologies and research. Better manage the challenging clinical scenarios you may encounter with case studies that include a brief introduction, clinical decision-making techniques, evidence-based rationales, and selected references for further study. Remain up-to-date in this rapidly evolving field with clinical recommendations, updates on the latest technological advances, troubleshooting techniques, and recent key clinical trials. Access practical examples regarding the process for selecting and implanting devices, as well as follow-up care for heart-failure patients being treated with CRT. Stay abreast of today's novel wireless technologies, information on robotic-assisted implantations, and current methodologies on VV optimization. 1: PAROXYSMAL ATRIAL FIBRILLATION IN CRT-PATIENTS: CHALLENGE OR ROUTINE?